First, I just want to apologize for being MIA on the blog recently; I've been buried under a multitude of projects that have been keeping me busier than usual (and that's saying something because I am always busy.) Some of have been downright draining, while others have been extremely positive, encouraging and absolutely necessary. 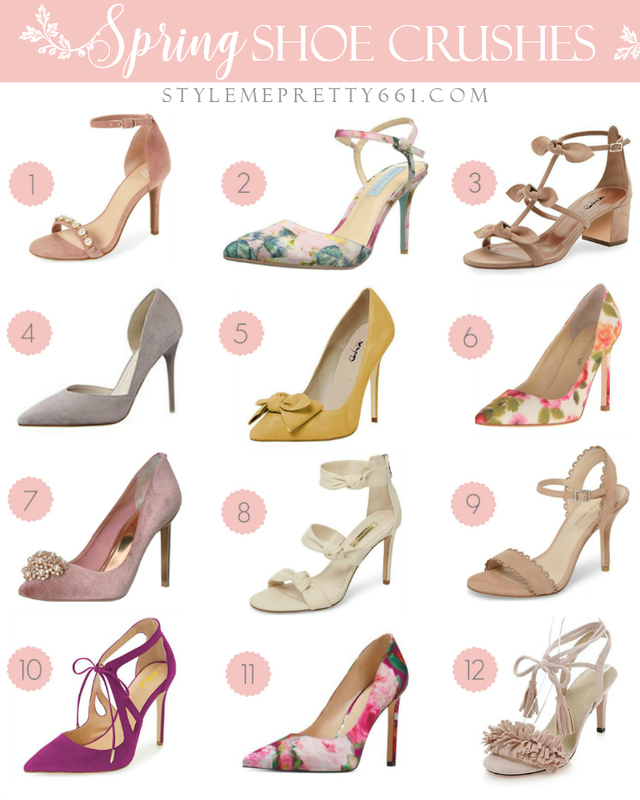 I'll get into more of that in a bit, but first, let's take a moment to drool over all of these amazing shoe finds! I'm having a serious case of Spring fever, can you tell? Spring is my all-time favorite season, with Summer being a close second, especially when it comes to fashion. All of my favorite light and airy dresses make their reappearance, along with my favorite pastel-hued and floral-embellished accessories and shoes. Since it's #tuesdayshoesday, of course I'm placing the spotlight on all the pretty shoes. Bows, scallops, pearls, and tassels -- all the pretty, little details I can't get enough of are rounded up for you in one place! Better yet, most of these are $70 or under! Only a few are a bit of splurge, but high-quality shoes that you know will last you years to come are worth it, if your budget allows for it. I'm sneaking in a few more pairs in the widget below, including these mules I just picked up! Going into the new year, I had a few, simple goals that I knew I wanted to achieve. I'm breaking them down quickly for those of you who may be interested. This is a tough one for me because I've become a master multi-tasker. Unfortunately, for perfectionists like me, it comes at a price. I end up staying up far too late at night justifying that it's "only a few more minutes" (either working on the computer or doing last-minute housework like laundry) which leads to hours, and then when I do sleep, it's often broken sleep because the kids will wake up needing something. Chronic lack of sleep adds up and starts to impact my mood, eating habits, and even my ability to focus or remember things. It's one big snowball effect, and I'm sure many of you can relate! So, this year, I'm focusing on tackling the large projects first and not pushing myself to the extremes to get every single thing done on my to-do list. This is forcing me to re-prioritize my projects and "unplug" in the evenings when dinner and family time are so important. This goes hand-in-hand with the first goal. I need more sleep. Period. I've really noticed a difference in my health over the past year, and one of the culprits is lack of sleep. Without sleep, the immune system is more susceptible to attack; there's case-loads of evidence that show the critical role that sleep plays in our overall well-being. So, for me, this means forcing myself to unwind and relax in the evenings to prepare for an earlier bed time. This also means putting down my cell phone and restricting myself from checking email or going on Instagram/social media, especially with my tendency to get sucked into it for hours! This includes a couple of things: more daily exercise and better eating habits. I'm horrible at both! Last year, my exercise routine, if you can even call it that, consisted mostly of some walking and running (chasing after kids counts, right?) and occasional dancing for fun. But I haven't followed an actual exercise regimen in years. We're talking 5+ years since I've stepped foot into an actual gym or done any type of daily cardio-aerobic or even anaerobic exercises. I do a lot of walking, so that has helped, and am fortunate to have inherited a fast metabolism from both my parents. As I get older, though, I'm realizing I need to take more responsibility for my health, which means making exercise a daily part of my routine as well as making better eating choices. I'll still eat my pizza and tacos... because eating cauliflower rice all day will likely kill me (lol) but I'll eat them in moderation and be better about adding a heaping scoop of fresh veggies and fruit, too. I'm also cutting out processed food and trying to eat "clean." I incorporated small changes, too, starting every morning with a warm cup of water mixed with 2 Tbs. of organic apple cider vinegar, the juice from half a lemon, and a small squirt of organic, raw honey. You can read about the benefits of drinking this here. I do it to jump-start my immune system each day. If you follow me on Instagram, you know I've just started the popular BBG exercise program. Holy moly, that program is no joke! I was ready to drop after session 1! But, I have to say, it felt amazing to push myself and my body, and you know what? I did it! Every small goal you accomplish counts, and I've been extremely proud of my progress so far! Since BBG is low-intensity high-resistance training, I'm also doing the More Better Me Hip-Hop Zumba classes on YouTube for my higher-intensity cardio workouts. I love dancing and exercising to hip-hop, and Camela's energy is so contagious in her videos, it 's hard not to have fun and stay motivated! To keep me on track with my fitness goals, my husband recently surprised me with this pink/rosegold FitBit, and I'm loving it! It tracks my daily heart rate, exercise activity, water intake, and even my sleep so that I can review and analyze my sleep patterns! So, those are my top 3 goals for 2018. As you can see, self-care is a large part of it; I feel it's so crucial for a better me -- physically, mentally, and emotionally. I have a few other smaller goals that I'm working on, too -- early Spring cleaning, culling and purging my closet, shopping less and being more selective in what I purchase, as well as re-styling more of what I already own. It's all still a work-in-progress, but I'm getting there! Baby steps are better than no steps at all, right? And don't get me wrong -- I'm still overwhelmed with projects: daily work, mom/wife duties, landlord duties (including a pending property remodel and sale that's driving me insane), my own kitchen and master bath re-model plans, family vacation plans (a good stress), house-hunting (our family of 5 has outgrown our current house), and a million other things, but you know what? That's life! We all have our daily responsibilities and stresses, but we have to try to make the most of them. I'm already finding that the steps I'm taking to achieve my goals above are helping me to better cope with these situations, and I'm sharing them with you in hopes that they'll help you, too. It's worth a try! I hope you're having a great start to the year, and I'd love to hear what goals you're working towards in 2018!